Halifax is growing quickly and residents are looking for a transit system that works for them. Last month HRM released the results of a poll that showed 61% of respondents want improved transit and 41% are interested in exploring commuter rail as a priority. Transit needs to be considered in an urban transportation context. In the city, we have commuters taking cars, walking, biking, and taking transit to get to work. At rush hour, a full bus has 50 people on it, a ferry has 300 and a train carries 200. That’s a lot of cars taken off our roads. Our transportation strategy must also include bike lanes, paths and all the active transportation planning we have been talking about since 2006. It needs to be funded and built. This will further help take pressure off the road system. It’s critical that public and non-automotive transit receives the funding it needs to build a system that is second to none. Don’t tell me the money isn’t there. Right now, HRM is spending $160 million on a convention centre. Halifax Harbour Bridges is spending $200 million to upgrade the MacDonald Bridge. There is talk about a new bridge sometime in the next generation that will cost at least $1.2 billion. The city and the province are talking about a Bayer’s Road and highway expansion which may cost $300 million. Yet when we talk about transit, a good year sees just $25-35 million invested in infrastructure and vehicles. Contrast that with Ottawa, which is spending $2.1 billion on expanding light rail. Edmonton: $425 million. Vancouver is spending $1.4 billion to expand existing systems. Even acknowledging our smaller population, we just don’t measure up. Halifax needs to get in the game. And it needs leadership that is prepared to do what it takes. The majority of daily commuters work in downtown Halifax and in Burnside. Our transit system shares the road with the rest of the grid-locked commuters coming on and off the peninsula, trying to get over Magazine Hill or off the circumferential highway into Burnside. On the peninsula we need to find ways around the traffic. We have a limited number of lanes on and off the peninsula. That is why I think we need to take a serious look at rail. The railway cut bypasses all the traffic on the peninsula, the Fairview overpass and the Bedford Highway. Alternately, we could explore dedicated bus lanes and bus ways but I think rail may actually be the cheapest approach, all things considered. If we build commuter rail we need to make sure we extend the rail line from the Via station right into downtown along the road system. This proposal will work best if it drops people off as close to their offices as possible. This can be done safely using new alternate FRA compliance low floor train sets, like the Stadler GTW pictured above. We need a dedicated network of bus lanes and HOV lanes to Bedford, Sackville, Dartmouth, Clayton Park, and to the new rail stations. We need to rework the bus routes to move people to terminals and get them on high-capacity fast transit links. 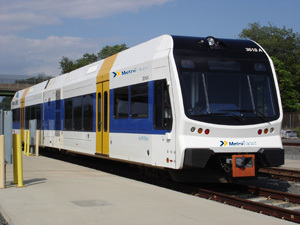 We’ve seen how the Portland Hills Metrolink Park & Ride is full every working day. We need an aggressive plan to grow the current Metrolink system – to go from hundreds of parking spots to thousands. We need people to be able to get on a bus that whisks them to the rail, to the renewed ferry system, or to downtown or Burnside. Inside the suburbs and the urban core we need to make sure the bus system serves residents on their way work, to go shopping, to the park, or the doctor’s office. It will take decades to build the transit system we need and deserve. We require much braver leadership with the vision that will allow us to achieve this goal. And we need to start now.